Koubychine, Y.A. ; Aloev, A.; Shvedunov, V.; Pakhomov, N.
For certain type of electron accelerators injection from an off-axis cathode is required. This is the case of a racetrack microtron (RTM), in which the beam passes several times through the accelerating structure, or of a high power standing wave electron linac, for which the lifetime of an on-axis cathode would be strongly reduced by the electron back-bombardment. The standard solution with the beam injection via a dipole magnet from an electron gun placed off-axis is too bulky, moreover in case of RTMs it requires special compensating dipoles. An annular ring cathode gun used in some accelerators leads to large beam emittance and divergence. As a new solution we describe a 3D on-axis electron gun with an off-axis cathode and a central hole for the beam passage. Results of the design optimization and performance of an electron gun built for a miniature 12 MeV RTM for medical applications are presented. We also discuss results of the beam parameters measurements and estimates of the beam emittance. Koubychine, Y.A. [et al.]. 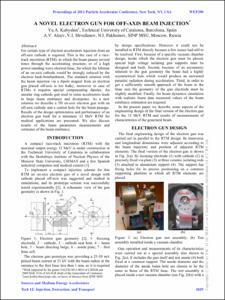 A novel electron gun for off-beam injection. A: Particle Accelerator Conference. "Proceedings of the 2011 Particle Accelerator Conference". Nova York: 2011, p. 2029-2031.